Code Purple has been extended! We will now be open through Monday night (March 21st). Call 519-0024 for further details. Code Purple will be in effect 3/19-3/20. It looks like the temperatures are dropping. Code Purple Sussex County will be in effect for Saturday March 19th and Sunday March 20th. Please call the hotline at 302-519-0024 for further details. Code Purple is NOT open 3/14- 3/17. Code Purple is closed through March 17th. We are keeping a close eye on the temperatures and there is a possibility of opening a few times through the end of the month. Keep a watch for further updates. 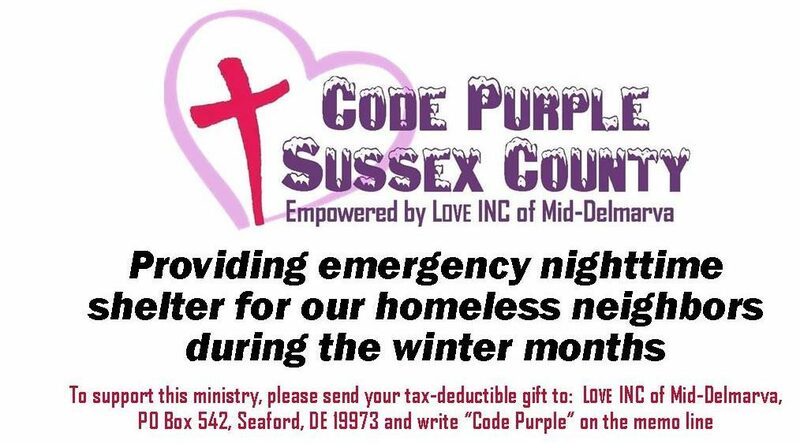 Code Purple Sussex County will be in effect tonight through Sunday night.